Feel instantly at home as you walk into this brand new 5 bedroom luxury villa, Contemporary Luxury. You will be surrounded by modern touches and the feeling of high living in each room. The downstairs gathering room has not only one but two 60 in flatscreen TVs, a Slate pool table and a seating area. 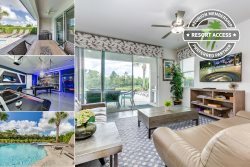 The villa boasts a fantastic pool area, with comfortable lounge chairs and outdoor dining options as well as a summer kitchen to grill up something great. There is a tastefully decorated master suite with a comfortable king bed located on the ground floor offering extra privacy for the adults. The calming tones and nautical theme will make you feel right at home. Head upstairs to see the remaining bedrooms including 2 king bedrooms, a queen bedroom, and two twin bunk beds for the kids. The second floor master bedroom has a King bed, a seating area, and neutral tones to offer you the perfect place to relax. The kids will love having their own space in the fun beach themed bedroom with bunk beds! After dinner, pick from a variety of entertainment options in the games room which has a retro meets contemporary theme. This villa offers a multi arcade system, a PlayStation 4, a 55 inch SMART TV and an air hockey table. There is simply something for everyone in this games room! All of this and more can be yours! Plan a magical vacation and book this house today. Your family will make memories that will last a lifetime in Contemporary Luxury. Pool heat available for $40 a day. If you would like the Spa / Hot Tub to be heated you will need to add pool heat to your reservation. While staying in this property you and all of your party will be able to use the majority of Reunion's amenities such as;6 swimming pools, children's activity program, bike hire, boutique spa, on-site restaurants and bars. Had an issue with the natural gas barbecue. Contacted the guest services team and maintenance was sent out that afternoon. There was a problem with the gas connection, that could not be repaired immediately. A temporary grill was delivered to use in the interim. Natural gas barbecue was repaired the following business day. Home was in excellent condition. My only recommendation regarding this property is the lighting in the living/kitchen area. The lights are very dim, which makes it difficult to utilize this area during the evening hours.